Meat By The Case Meat Market is a family-owned business in Hugo, Oklahoma. Meat By the Case is a meat market that specializes in the selling of meats in bulk to the communities we serve, both near and far, at competitive prices. Called MBC Meat Market, for short, we are proudly a family-owned and operated business in Hugo, Oklahoma. The meats we offer are high quality and sold fresh, fresh-frozen, or ready to eat. Our #1 goal is to provide quality meats at great prices while providing excellent, friendly service to our customers. 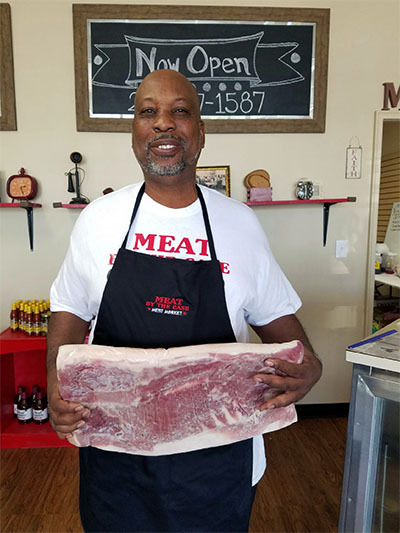 After retiring from a successful 31-year butchering career with a large meat company, Albert “Pops” Holloway with his wife, Kathryn, founded MBC Meat Market in Hugo, Oklahoma. He wanted to help the people in his community have access to quality meats and be able to buy those meats in bulk to save money for their families. MBC Meat Market has since become a well-known staple in the community, providing friendly service and community goodwill since its opening. MBC Hugo recently underwent an expansion renovation. It is now much larger and even includes a mini-restaurant set up for hot food service.